The source code and data files are available in the code/Chapter12/ directory tree. In this example we have brushed over a very small region of Zurich, encompassing only a few stops. The radial histogram here shows that the majority of the delays happen during rush hour, suggesting that perhaps these few stops are mostly used by work commuters. Let's see how we made this visualization reusable. 002:    var slices = 24, // 24 hours in a day. 005:        innerScale = d3.scale.linear(), // Define a scale for sizes segments based on value. 007:        dimension, // Our empty dimension variable. 008:        offset = 50, // Label offset value. 013:        color = d3.scale.linear(); // Linear color scale used for the segments. 015:    // as the only argument. 018:    // Method to get/set the inner radius. 024:    // Method to get/set the outer radius. 030:    // Method to get/set the crossfilter group. 036:    // Method to get/set the label offset. 042:    // Method to get/set the crossfilter dimension. 048:    // Method to get/set the color range. 055:    // Method to get/set the radial range. 062:    // Finally, return the chart. This takes care of the basics for our module. Now we just need to work on the code that will execute on the d3.js selection and actually create the visualization. This is the code that will be executed every time we call our module on the selection, and thus is also the code responsible for updating the visualization when new data is passed in. The first part of our function is pretty straightforward. We first look to see if the inner and outer ranges have been set by our setter functions, and if not we set them equal to the default inner and outer radius, respectively. Then we use the d3.js arc generator to construct a generator for both segments of the radial chart and the labels. 002:    // If the innerRange is not defined, it equals the innerRadius. 004:    // If the outerRange is not defined, it equals the outerRadius. 006:    // Our d3 arc generator for the segments. 016:    // Our d3 arc generator for the labels. The code above setups our arc generator by setting the inner and out range of the radial histogram to the value specified in the setter functions, and also sets the angle of the arcs based on how many slices are defined in the setter function. In addition, it sets up an arc function for the labels. The label function is essentially the same, but we add an offset value to offset the label text from the actual graphic. This offset is also defined via a setter function. 016:    //Our d3 arc generator for the labels. 028:        // The total number of delays for they city. 030:    // Obtain the min and max for both totalRecords and totalDelays. 031:    // if there are no records, set to zero. 041:    // and totalDelays array and splice to the beginning and end as required. 055:    // will use this for our scales. While the code above looks intimidating, we are simply inspecting the data we want to visualize, and checking for missing hours in the data set. If an hour is missing, we simply splice it into the data set with a value of 0, to ensure that our radial histogram accurately displays the information. 062:    // Set the range and domain for our innerScale using the min and max from the totalRecords. 066:    // Update our segments using the current data. 073:    // Add any new segments using the current data. 079:    // Remove and extra segments. 081:    // Attach our mouseover event. 083:    // Add our labels. 093:    // Remove center text on chart update. 095:    // Add the center text for the chart. 100:    // On mouseover function to display segment total. The code above is where we bind our data to the DOM, and the enter, exit, or update as needed. This should be a very familiar pattern to you if you have been using D3.js. 001:// Instantiate our radial module for each city. 008:// Set up the DOM for each city for the radial chart. This will initialize our visualization with no data, so we aren't going to see much. We need to pass in the data we filtered by brushing over the map. We will do this by using the dimension and group methods of our module. We will need to do this inside the brushing event handler of our mapping module, just like we did at the end of the last chapter. 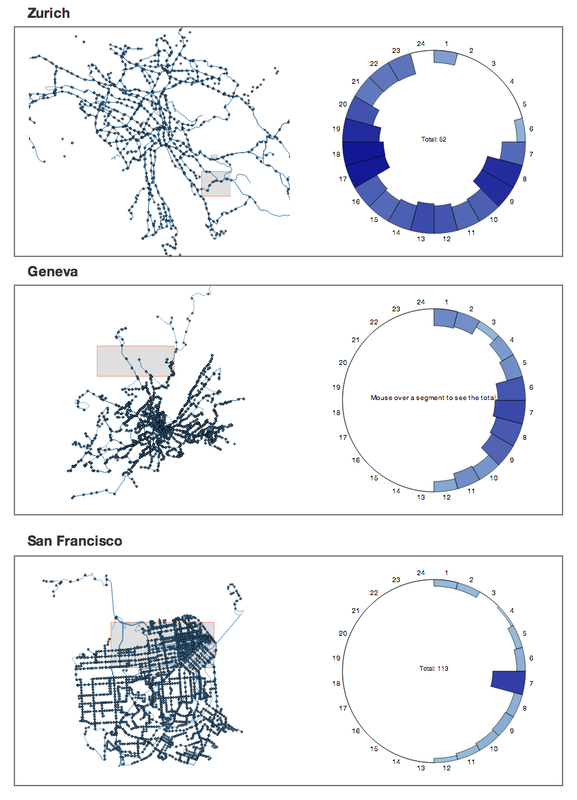 001:// On map brushing, filter the stop metric data, pass filtered data into radial chart. 003:    // Get the locations inside the brush. 005:    // Get the delays inside the area. 007:    // Pass in our filtered delays to the radial histogram. 009:    // Update radial chart with the new data. There you have it! A comprehensive, interactive visualization of three cities using reusable components! This application serves to demonstrate the power of the reusable API. We have created a complex visualization consisting of brushing, custom events, crossfiltering, and dynamic updating, but we have done so in a way that is easily adaptable and scalable. This application could be adapted quickly to use the data from your own city. We encourage you to take the source code and try it out!